It is true, that love and affection for the Saand family brought Baba to Rahata. However, there was another motive also – that of asking for Dakshina. Therefore, with the welfare of His devotees in His mind, Baba requested for Dakshina – sometimes directly, sometimes by paying visit in their dreams or sometimes from the devotees, who had come for His Darshan. This msg is for " v2birit - Global Moderator"., Thanks for sharing such wonderful stories about Sai which takes us to his time and we can imagine us in that crowd in shirdi with Baba's divine presence. Wonderful, Sai bless you for these beautiful posts. Baba taught Nanasaheb the qualities of a good disciple and also put him to various tests in the matter. Not only that, He narrated how an ideal Adhyatmik Guru should be and how to identify him. Madhavrao was an expert singer, as well as an accomplished actor. Madhavrao was blessed with a sweet voice and good looks. Therefore, he became an excellent medium for popularizing the poetic contributions of Dasganu amongst common folk. Besides complementing the talent of each other, they had certain other common interests. Both of them were religious minded and were equally immersed in the thoughts and worship of the Almighty. They were also not interested in worldly desires. Dasganu had gauged the true liking of Madhavrao’s mind. He, therefore, in 1897 (or there about) took him to Sai Baba. There, Madhavrao got what he was searching for all along and succeeded in getting peace of mind. Whenever Madhavrao visited Shirdi, he stayed there for long periods of time. He sustained his living by taking private tuitions. He set his foot on the path towards Shirdi as soon as the thought struck him. 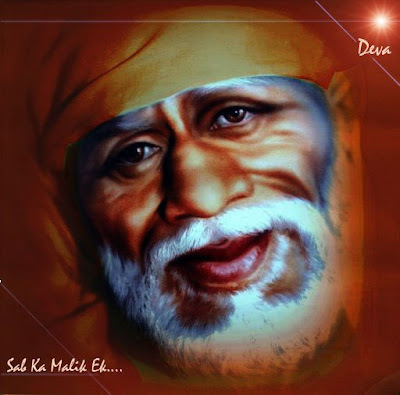 In 1903-04, he was in Shirdi, totally immersed in Baba’s thought and suddenly a poem got composed in his mind. It was a poem devoted to Shri Sai Baba in the form of an Aarati. Dasganu was amazed and very happy with the song. But, Madhavrao thought nothing much of his creation and put the piece of paper in his pocket. Madhavrao’s basic nature tended towards Vairagya. Therefore, he was very happy to spend his time in Shirdi and be near his Sadguru and was never keen on returning back to his wife and other family members. His relatives searched for him everywhere, but to no avail. Ultimately, the search ended, when one Raghopant, who had spotted Madhavrao in Shirdi, conveyed the information to them. Madhavrao’s father went to Shirdi and brought him back. Against his own wishes, Madhavrao obeyed Baba’s diktat and returned to his home and family life. In due course, a son was born and named as ‘Ramchandra’. Whenever Madhavrao was not in Shirdi, he would be restless. His heart yearned to be there. On one such occasion, as the holy festival of Ram Navami was fast approaching, Madhavrao wanted to be in Shirdi as soon as possible. In reality, his health was not good. He was worried as to how he will manage the trip. Just then, two of his friends arrived and they took him with great care to Shirdi. This is how Baba used to know the utmost desires of His devotees and fulfil the same. Try to imagine the feelings and joy of Madhavrao on hearing Baba’s message ! Because of the good deeds that he must have done in his earlier births, Madhavrao was fortunate to have a Sadguru like Shri Sai Baba. But, besides Shirdi, he used to repeatedly visit various places of pilgrimage such as Kashi, Rameshwar, Balaji, Gangapur, Narasobachi Wadi, Mahur, Tuljapur, Pandharpur and a host of others. Therefore, during these visits, he could be near great men like Gajanan Maharaj, Akkalkot Swami, Balbheem Maharaj, Sakhaya Swami Dehukar, Vasakar, Vyankat Swami, Vinayakbua, Dada Maharaj and other saints and holy men. He received their blessings. Madhavrao had a sweet voice and due to his in-depth study of various religious, historical and mythological topics, people loved his singing and rendering of kirtans, bhajans and pravachans. Madhavrao could compose poems very quickly. However, he always bowed his head before the mastery of a great poet like Dasganu. He would make it a point to attend and listen to Dasganu’s kirtans. He knew many of Dasganu’s kirtans and poems by heart. We find a reference that while he was in Shirdi, Madhavrao once rendered Dasganu’s kirtan on Shri Eknath Maharaj. It was Dasganu’s practice to recite ‘Vishnu-sahasra-naam’ 12 times every day. Seeing this, Madhavrao also began to follow the practice. He continued this till his demise. And even now, the practice is being followed by some members of his family. Madhavrao made it a point to accompany Dasganu and attend the festival of Ram Navami every year till 1952. Page created in 0.358 seconds with 60 queries.